This page provides information and links to help in choosing and buying high quality seafood steamers for cooking shrimp, crabs, lobsters, crawfish, clams, oysters, mussels, and other shellfish. A good option for most cooks is a small one piece seafood steamer. These come in 12-36 quart versions, with either a stainless steel or coated metal construction. These steamers have either a basket or steaming rack to suspend seafood above the water level. A 12 quart steamer is a good choice for steaming a simple dinner for 2 such as 12-18 blue crabs, 2-3 pounds of shrimp, 2 medium lobsters, or a meal of clams, oysters, or mussels. For larger amounts of seafood, a three piece steamer is a good option. These steamers consists of three separate parts: a bottom pan which holds the steaming liquids, an upper pot for holding food (the bottom has holes to allow the steam to pass through), and a lid on top to keep the steam in. Three piece steamers are also available in stainless or coated metal, in sizes from 16 quarts and up. 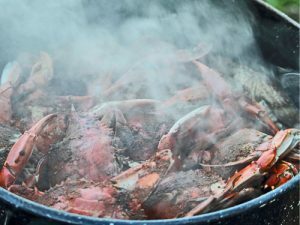 A 19 quart steamer will cook about 36 blue crabs, several dozen clams, oysters or 2 medium lobsters. As with any steamer, the design of three piece steamers should allow seafood to be suspended 2-3 inches between the liquid. Outdoor steamers are a good choice for summer cook outs and other events where a large amount of seafood needs to be steamed as they keep the steam, odor and mess outdoors. Outdoor setups typically consist of a steaming pot ranging from 36 to 100 quarts or more, heated by a gas burner. An 80-100 quart steamer pot will easily hold one full bushel of crabs, clams or oysters. For best results, large size steamers should be used in conjunction with a free-standing outdoor propane gas burner. Smaller burners, rated at around 50,000 BTU are suitable for steamers up to about 60 quarts. Larger versions, rated at 150,000-200,000 BTU are capable of heating pots from 60-120 quarts. In some cases full featured gas grills are another option for heat, as some models have high output burners made for heating large pots and steamers.